I have a great many locations on my custom Google map, many of which can be shot at any time of year. There are a few however that are best shot at particular times of the year. Bedruthan Steps on the north Cornish coast is one such location. It has plenty to offer the photographer with golden sand beaches (at low tide) and miles of dramatic Cornish coastline. It's spring time though when Bedruthan Steps comes to life. Like many areas along the coast, springtime brings on the flowering of the thrift, a beautiful pink flower that likes to cling to the side of the coastal cliffs. If you can find a nice clump of thrift and you are lucky enough to get some great morning or evening light, you'll have everything you need to produce an amazing image. While there a number of locations to shoot the thrift in Cornwall, my favourite place to shoot them is at Bedruthan Steps. There is nothing quite like seeing the thrift flowering all along those stunning coastal cliffs. The thrift flowers in spring but it may only be in its prime for a couple of weeks. This unfortunately isn't exactly the same time every year so knowing when to go isn't easy. Bedruthan Steps is a 1 hr 40 minute drive so I want to be reasonably assured of good conditions if I go. I would also need to the good conditions to match up with a free evening for photography! However, time was ticking for me. I had started to see some spectacular shots of the thrift at Bedruthan Steps on Instagram so I was starting to panic that I was going to miss the best of the thrift this year. Luck had not been with me. When I had a free evening the weather was rubbish, and when the weather was forecast was good I didn't have free time. I was getting frustrated! As mid May rolled round I came to the conclusion that I would have to go now or forget about for this year. So with a dubious Sunday evening forecast I decided to put caution to the wind and go for it regardless of the conditions. I hope you enjoyed that video and that it has indeed inspired you to visit Bedruthan Steps. If you want to see the images from the video in a bit more detail you'll find them below. Nikon D750, Nikkor 16-35 f/4 @ 22 mm, f/16, ISO 100, 80 seconds, Lee Filters Circular Polariser, Little Stopper and 0.9 medium edge ND grad. Nikon D750, Nikkor 24-70 f/2.8 @ 48 mm, f/11, ISO 100, 2 seconds, Lee Filters Circular Polariser, and 0.9 medium edge ND grad. Nikon D750, Nikkor 24-70 f/2.8 @ 32 mm, f/11, ISO 100, 2 seconds, Lee Filters Circular Polariser, and 0.9 medium edge ND grad. Lenses - Take a wide angle lens for shooting the thrift, but also take a medium telephoto (like a 24-70mm) and shoot and isolate some of those rocky sea stacks. Walk the Walk - Though there are a couple of great viewpoints just a short walk from the National Trust car park, you'll find so much more by walking along the coast path. So give yourself sometime to explore the area. The beach at Bedruthan Steps is also worth checking out, but only at low tide and you don't mind the steep descent. Be Careful - It should go without saying, but do be careful on the cliffs, especially when photographing the thrift. It's all too easy to get very close to the edge in search of some nice thrift, and if it's windy up there you don't want to loose your balance. Though I was keen to get to Bedruthan Steps to photograph the thrift, it is a location I will visit at anytime of year. The coast line is beautiful and spectacular there and given the right like it can make for some epic photographs. 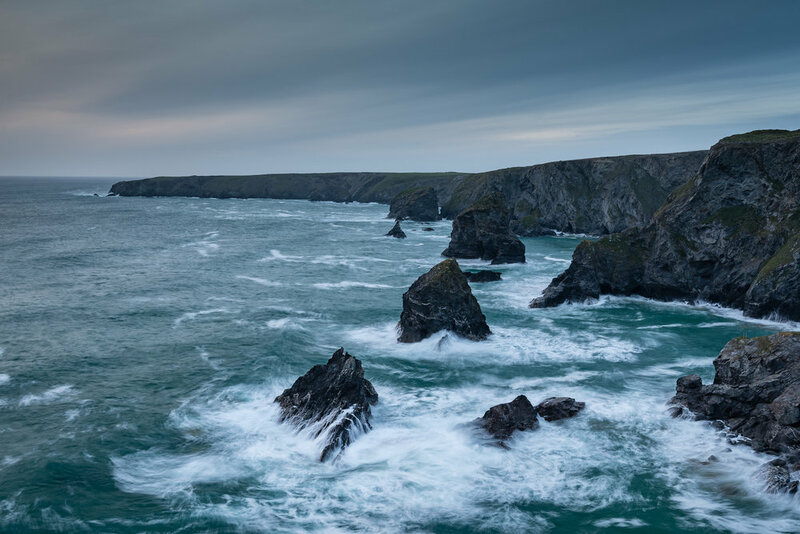 So have you visit Bedruthan Steps? Have you photographed thrift before? Let me know in the comments below.